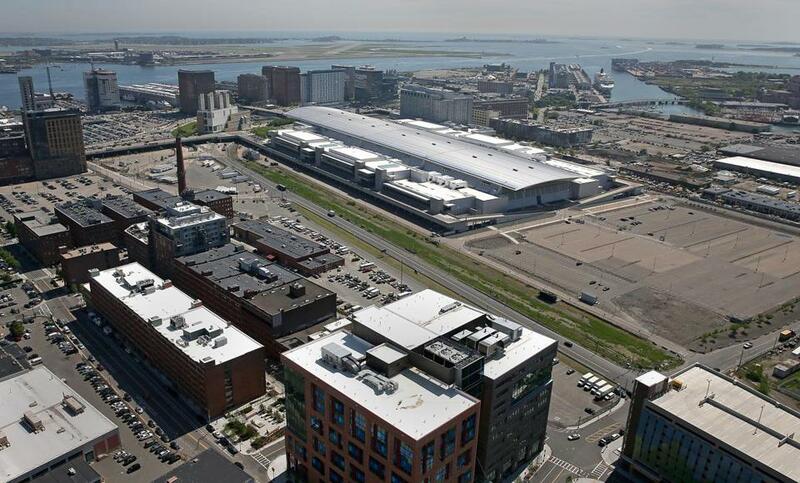 The convention center authority controls about 30 undeveloped acres in South Boston. The Massachusetts Convention Center Authority controls about 30 undeveloped acres in one of the country’s hottest real estate markets. Now, the agency is trying to figure out what to do with that prime real estate. The agency plans to issue a request for proposals within the next several weeks to hire a firm that will help analyze options for land the MCCA owns around its Boston Convention & Exhibition Center in South Boston. Much of that property, primarily used for parking, was once scheduled for an ambitious $1 billion expansion of the convention center. But Governor Charlie Baker put those plans on hold in April 2015, citing the expense, and since then has shown little interest in revisiting the subject. Hiring a firm to help develop a new plan for the agency’s South Boston campus could be the next step in reviving that expansion. But David Gibbons, the convention center authority’s executive director, said the additional development probably would differ from the previous expansion proposal. The authority’s board probably wouldn’t make a final decision about how to proceed with the land until sometime next year. The authority’s decision to pursue a new development plan has the state legislators who represent South Boston worried that the convention center expansion could be sidelined again, this time by more profitable alternatives, such as housing or retail. Representative Nick Collins and Senator Linda Dorcena Forry on Thursday attended a convention center board meeting to register their concerns and possibly influence the parameters of the upcoming study. They were chief proponents in the Legislature for a bill that would have financed the expansion. “We have concerns that the agency — given the development and the businesses that have recently called the area home and the value of such a piece of property like that — that people might get some ideas,” Collins said. Collins and Forry said the Boston Redevelopment Authority originally took land there by eminent domain specifically for the convention center, and that future growth on the property should reflect that initial purpose and involve hospitality or convention-oriented spaces. They’re worried that some of the land could be sold off for residential or retail projects. Gibbons said he’s keeping an open mind about the next steps. He said the authority controls about 70 acres in South Boston, with about 30 still undeveloped. One possible shift: an expansion that would focus more on meeting and ballroom areas and less on exhibit hall space, to reflect the growing demand among business associations to hold meetings in the city. He said he hopes the consultant’s report can provide information about the demand for convention space in the industry, as well as how to better integrate the convention center within the surrounding neighborhood. When the convention center opened in 2004, much of that part of South Boston looked barren. Today, development projects are sprouting all around the building. General Electric Co. just hosted a groundbreaking for its new headquarters in Fort Point, and Omni Hotels & Resorts unveiled plans for a hotel with more than 1,000 rooms across Summer Street. “We’re now in the eye of the storm, instead of the edge of the world,” Gibbons said. The Omni announcement was the primary trigger for the new feasibility study. Massport last year focused on the Omni proposal for a 2.1-acre parcel that the port authority owns across the street. Massport’s board officially approved the project last month. Gibbons says he has been hindered in attracting new conventions to Boston because of an inadequate supply of hotel rooms within walking distance of the convention center. The Omni project, which would be the largest hotel in the Seaport area when it opens in 2021, changes that dynamic. “Now that the hotel rooms are becoming a reality, it’s time for us to do a compass check,” Gibbons said. James Rooney, chief executive of the Greater Boston Chamber of Commerce, says he remains hopeful that an expansion will still take place, despite the long delay. Rooney was Gibbons’s predecessor at the convention center authority and a cheerleader for the expansion.